So anyway – here I am not working and trying to get well as quickly as I can. I have been experimenting with my diet and after reading lots from Michael Pollan (The Omnivore’s Dilemma) and quite a bit on the Paleo or Caveman diet, I have decided to really cut out the refined food from my diet. That is where I am starting. There is actually another level to the Paleo diet called AIP Paleo – which stands for Auto Immune Protocol – that addresses excessive inflammation in the body. Inflammation that takes the forms of Arthritis, Lupus, etc. Things that I am trying to avoid. Also – the faster I heal, the faster I get off the Prednisone. AIP is VERY limited so I am easing into it and really trying for a 95/5% ratio of sticking to this new way of eating. With that in mind I am sharing a recipe I made last night for dinner. I love Tomatillos – they are so flavorful and amazing. 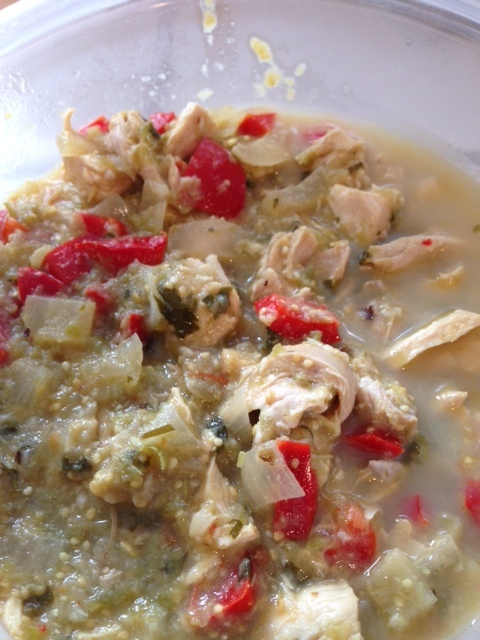 So I made Chicken Chile Verde. It was an easy recipe. So here are the little guys after being washed. I then cut the up and roasted them with some garlic cloves for about 10 minutes. Here they are going into the oven. 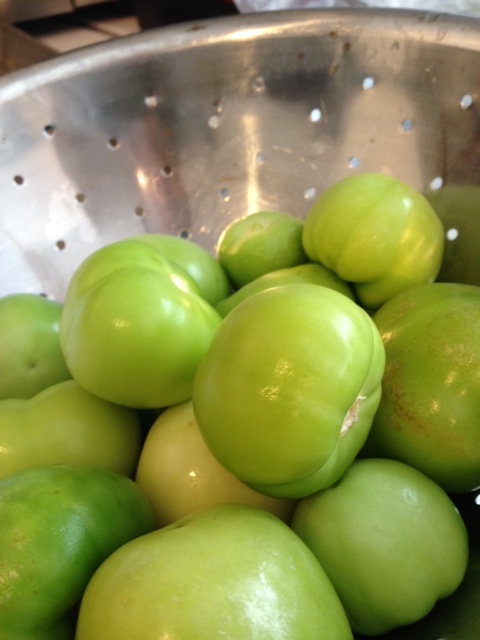 Remove the papery husks from the tomatillos and rinse them well. 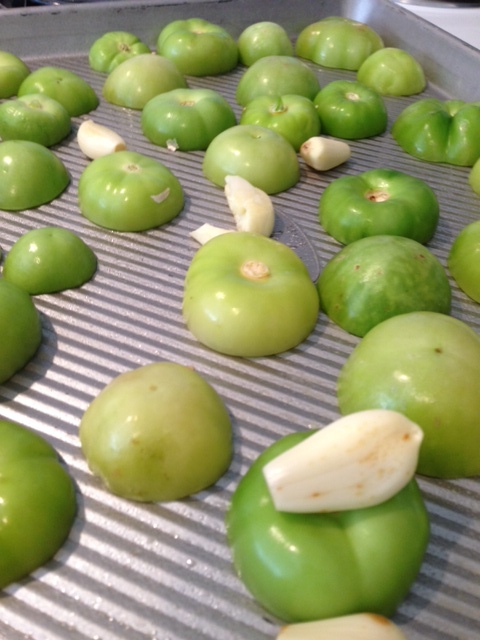 Cut the tomatillos in half and place cut side down on a baking sheet. Add the garlic cloves. Place the pan under the broiler for about 5-7 minutes, to lightly blacken the skin on the tomatillos. (You can also roast them in a 450ºF oven for about 10 minutes). Allow to cool for a couple minutes. Put the tomatillos, garlic, onion, cilantro, jalapeños, lime juice and zest, cumin, honey and salt into a high speed blender or food processor and blend until all ingredients are finely chopped and mixed. Store in refrigerator. Cut up the chicken any way you like – I did long pieces as it will be shredded with two forks later, but you can leave it whole if you like. Add the salsa verde and two cups of liquid (water, broth or combo of the two) to the slow cooker. Place the chicken parts in and add the onion, bell pepper, bay leaf, ground coriander and fresh cilantro. Give it all a stir. Let simmer at least 1 hour to marry the flavors together. When the chicken is cooked through (165 degrees or more), take two forks and shred meat either in the pan or on a cutting board and add back to sauce. Servie with tortillas, lime wedges, additional cilantro, sour cream, salsa, hot sauce and beans!